The Orpheum Theatre Group is excited to be a Kennedy Center Partners in Education team, in collaboration with Shelby County Schools. Through this program, OTG brings Kennedy Center teaching artists to work with classroom teachers across the Mid-South. 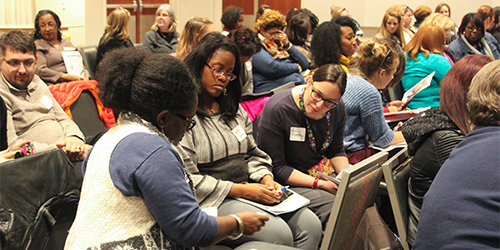 These arts integration specialists provide educators with tools and strategies to transform classrooms. Arts integration, as defined by the Kennedy Center, is “an approach to teaching in which students construct and demonstrate understanding through an art form.” This method allows students to learn in an innovative and engaging way and is proven to increase literacy, raise test scores, and help develop key communication skills. Back by popular demand, Melanie Rick will lead multiple workshops over the course of the week. Topics explored include: Defining Arts Integration, Assessment and Documentation, reading/writing, science, social studies, and visual art.